The physical therapy program at the University of Mount Union is designed to pursue academic, clinical, and professional excellence that will allow students to grow into leaders in a meaningful and professional career. Mount Union’s physical therapy curriculum is structured with opportunities for inter-professional education with our nursing and engineering programs and Northeastern Ohio College of Medicine, to name a few. According to the U.S. Bureau of Labor Statistics, the rewarding field of physical therapy is expected to exceed 30% growth in the next 10 years, making it the 26th fastest growing occupation. Physical therapy is also listed among the Buckeye Top Fifty: 2008-2018 among Ohio’s high-wage occupations in demand. Mount Union graduates of the physical therapy program will be prepared to fill this growing need in our society. Mount Union’s PT program is focused on inter-professional education, which will prepare you for the dynamic nature of healthcare. Two laboratory spaces with state-of-the-art equipment and two dedicated classrooms. A Motion Analysis Laboratory equipped with a Vicon© Motion Capture System integrated ATMI Force Plates and a wireless Delsys® Trigno™ system. Effective August 5, 2016, the University of Mount Union Physical Therapy Program has been granted Candidate for Accreditation status by the Commission on Accreditation in Physical Therapy Education (1111 North Fairfax Street, Alexandria, VA, 22314; phone: 703-706-3245; email: accreditation@apta.org). Candidate for Accreditation is a pre-accreditation status of affiliation with the Commission on Accreditation in Physical Therapy Education that indicates that the program is progressing toward accreditation and may matriculate students in technical/professional courses. Candidate for Accreditation is not an accreditation status, nor does it assure eventual accreditation. Applicants must complete all the listed prerequisites with a ‘C’ or better prior to enrollment into the professional curriculum. Please contact Brandon Crites at (330) 823-2587 or critesbr@mountunion.edu with questions regarding your application materials or status. University of Mount Union students and graduates: If you have graduated or will be graduating with a baccalaureate degree from the University of Mount Union, you will not need to request your transcript from the Office of the Registrar. Through indicating Mount Union as an institution on your application, the Office of Admission will obtain a copy directly from the Office of the Registrar, and your application checklist will be updated accordingly once that has been received. For International Applicants: The TOEFL-iBT minimum composite score of 89 with minimum subsets; 24 Writing, 26 Speaking, 21 Reading & Comprehension, and 18 Listening. Comparable values would be 220 on the computer-based exam; 560 on the paper based form, a TSE of 50 and/or a TWE of 4.5. The University of Mount Union has secured approval from the Higher Learning Commission (HLC) and authorization from the Ohio Department of Higher Education to offer the Doctor of Physical Therapy. The University has begun the accreditation process with the specialty accreditor for Physical Therapy; Commission on Accreditation in Physical Therapy Education (CAPTE). The University of Mount Union is considered to be a Developing Program by the CAPTE. There are several phases that are involved in the Preaccreditation Process. As the program completes the various phases of the pre-accreditation process leading to full accreditation the updated status will appear below. Effective August 5, 2016, the University of Mount Union Physical Therapy Program has been granted Candidate for Accreditation status by the Commission on Accreditation in Physical Therapy Education (1111 North Fairfax Street, Alexandria, VA, 22314; phone: 703-706-3245; email: accreditation@apta.org). Candidate for Accreditation is a pre-accreditation status of affiliation with the Commission on Accreditation in Physical Therapy Education that indicates that the program is progressing toward accreditation and may matriculate students in technical/professional courses. Candidate for Accreditation is not an accreditation status nor does it assure eventual accreditation. The Commission on Accreditation in Physical Therapy Education has a formal process for handling complaints about Physical Therapy Education Programs. Information about the process can be found at http://www.capteonline.org/Complaints. Complaints are submitted to the Department of Accreditation, APTA, 1111 North Fairfax Street, Alexandria, Virginia, 22314. CAPTE acts on these types of complaints at its next regularly scheduled meeting following receipt of the complaint. To obtain the materials necessary for submitting a complaint, contact the APTA Accreditation Department at 703/706-3245 or at accreditation@apta.org. The Mount Union Doctor of Physical Therapy program’s mission is to prepare sensitive, responsive Doctors of Physical Therapy to utilize evidence and best practices for lifelong service to patients, clients, and society. 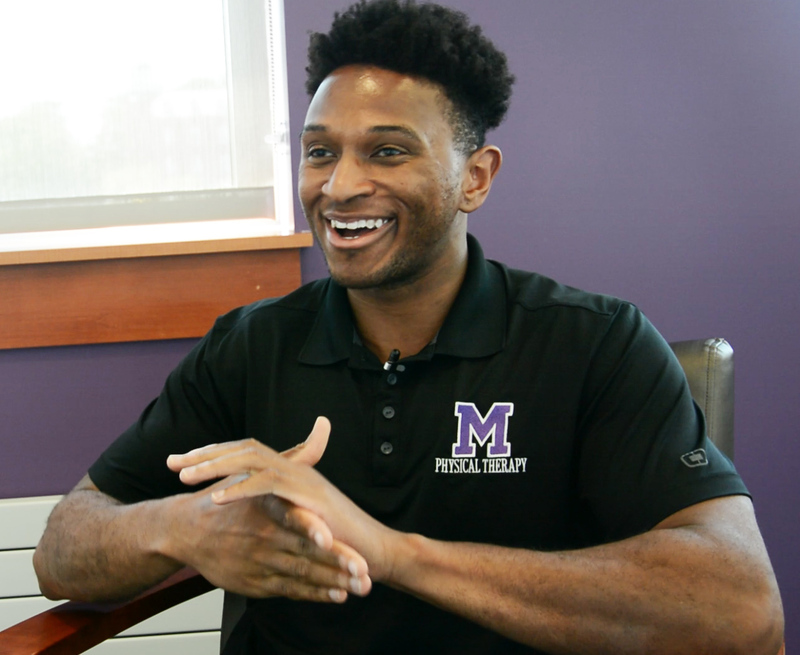 The University of Mount Union has a long tradition of preparing students to be compassionate, caring humanitarians, and this is the foundation for Mount Union’s Doctor of Physical Therapy program. Mount Union’s Doctor of Physical Therapy curriculum is structured with opportunities for inter-professional education with our nursing, physician assistant and exercise science pre-professionals to name a few. Review the estimated costs for Mount Union’s eight-semester (34-month) Doctor of Physical Therapy Program. Note: Living and travel expenses may vary widely, therefore they have not been included in this estimate. The student will be responsible for costs associated with housing. Students are also responsible for costs associated with housing and travel while involved in Clinical Education Affiliations. For more information about the University of Mount Union’s Physical Therapy Program and/or other PT program resources, browse the links provided. The reason I went into education years ago was to help students learn the complicated concepts in physical therapy education in a way that made an impact on them and changed the way PT's interact with patients and clients. I'm happy to see that Mount Union is actively involved in preparing students to be life-long learners. I am biased, but Gallaher Hall is my favorite building on campus. The thought that went into building such a technologically advanced structure to help further the medical professions was truly visionary. I would encourage students to be part of this program for the same reason I came here, to be part of something extraordinary! I looked up to my own PT faculty, and funny enough never wanted to graduate to still be in that environment - learning and growing. Classrooms should be fun, they should be open, and all relationships should be respectful.